​Compare bObsweep/bObi Floor Vacuuming and Cleaning Robots: bObsweep PetHair, bObi Classic or bObi Pet? If you've been thinking of getting a robotic vacuum cleaner to free yourself from one of the most tedious, exhausting and boring house cleaning jobs you have to do week after week, the bObsweep and bObi robots (made by the Canadian vacuuming robot manufacturer bObsweep) are definitely worth considering. These are not only very high quality products, but come with some features not available in other major brands available today. These robots do not just vacuum your floors, but while doing so, they can also sanitize and disinfect the floors with the UV light they are equipped with, and they can mop when an included mopping extension is attached to the robot. They can even recharge themselves automatically and resume the job where it was interrupted. In addition, these robots use HEPA style filters to trap more and smaller particles than non-HEPA filters equipped robots can, and they boast the longest and largest brushes out there, which improves the ability to pick up hair and fur, especially long hair or thick fur that may encumber other vacuums. If you are considering to acquire a bObsweep/bObi vacuuming robot, but you are undecided about which model to get, you will find this article useful. We will compare here the most popular bObsweep/bObi floor cleaning robots bought by Amazon customers, so you can decide which one responds best to your home's vacuuming needs. At the time of this writing these three robots were the most popular three bObsweep robots bought by Amazon customers. Note that bObsweep also makes other robots such as the bObsweep PetHair Plus, bObsweep Standard and bObsweep Junior. Though these three robots have not so far been as popular as the above selected three robots that will be compared below, they will still be presented further down in this article. These robots can work on all type of floors. Hardwood, carpet, tile or linoleum are all surfaces they can clean. Not only can they work on all floor types, but they detect the floor type they are on and adjust the cleaning mode and speed accordingly. At the time this article was written, the rpm suction power of bObsweep PetHair had not been yet specified on the product's website, but bObi Classic and bObi Pet have a stronger suction power than bObsweep PetHair. All three robots come with a mop extension and two mini microfiber mop cloths that can be attached to it. Once the mopping extension is installed and the mopping cloth attached to it, these robots can mop at the same time as they are sweeping, vacuuming, and disinfecting. The microfiber mop cloths included with these robots may be used dry or damp, with water or your favorite cleaning product, to remove stains from tile, laminate, concrete, wood, and any other hard flooring. All three robots are equipped with a HEPA Filter that traps allergens and pet dander in the air. HEPA filters can capture dust particles as fine as 0.3 micron leaving fresher and healthier air behind. HEPA stands for "high efficiency particulate air" and is a filter grade defined by the US Department of Energy which requires the filter to be able to remove more than 99.97% of particles as small as 0.3 micron. All three robots are equipped with a UV light to sanitize the floor as the robot works. The UV light disinfects and kills bacteria. bObsweep PetHair provides a button both on the robot itself and on the remote control device to turn on and off the UV light. bObi Classic and bObi Pet have a button on their remote control device to control the UV light. Note that the default state of the UV light when the robot starts running is on, but you can toggle it ON and OFF. ​With bObsweep PetHair, the cleaning mode is selected by pressing once the MODE button on robot’s cover. As a result, the "AUTO" sign appears on the screen. Then by pressing the PROGRAM button once, twice or three times, you select one of three cleaning modes available: mode 1 is for large spaces, 2 for medium and 3 for small. When you press START, the robot starts cleaning in the selected mode. In mode 1, the robot cleans until the battery falls below 15%. In mode 2, it works for 30 minutes and stops, and finally in mode 3, it works for 15 minutes and stops. Note that, in mode 1, since it cleans until the battery falls below 15%, the robot looks for the docking station to recharge. ​With bObsweep PetHair, you can also select the robot's movement patterns by pressing the MODE button twice on the control panel. As a result, the "SPOT" sign will appear on the screen. Then by pressing the PROGRAM button once, twice or three times, you can select the movement pattern: pattern 1 is spiral (1-4 min), pattern 2 is zigzag (1-4 min) and pattern 3 is along the walls and corners (about 10min). - GO! activates advanced movement algorithms to cover the most ground. The robot moves across rooms, along walls and edges, and extends her reach until all debris are removed and dusted. Using GO! regularly will eliminate every trace of pet hair, dander, and debris in your home. All of the robot's built-in cleaning patterns activate in this mode for a thorough cleaning. - WAFFLE targets a dense spill area. The robot traces a grid pattern on the spill zone to treat it with special attention. WAFFLE is suitable for small accidents and other localized messes as they occur in otherwise tidy spaces. - JUICE locates the charging station and auto-recharges the robot. The robot finds the charging station and docks to be recharged. The robot is also capable of looking for the charging station when the battery level falls to 15%. Note that GO!, WAFFLE and JUICE buttons are also available on the remote-control device. bObsweep PetHair is equipped with 2 touch sensors, 4 edge sensors, and 5 wall detection sensors. bObi Classic is equipped with 2 touch sensors, 4 edge sensors and 4 wall detection sensors. bObi Pet is equipped with 80 touch sensors, 4 edge sensors and 5 wall detection sensors. For a more efficient cleaning, bObsweep PetHair is equipped with dirt detecting sensors. If the robot reaches a spot with a lot of dirt or debris while cleaning, the dirt sensors will activate, the “DIRTY” sign on the screen will turn to ON, and the robot will increase the cleaning intensity of that area. bObi Classic and bObi Pet are also equipped with dirt sensors. Dusty floors, high-traffic areas, and small spills will ping the highly sensitive dirt sensors of these robots, so they adjust the cleaning accordingly. At the time this article was written, bObsweep PetHair was not compatible with bObi blOck. Though bObi Classic is compatible with bObi blOck, the unit is not included in the purchase of the bObi Classic and needs to be purchased separately (whereas with bObi Pet, it is included). MODE to select the cleaning mode (see Note 6 above). PROGRAM to schedule the robot. UV to control the toggling of UV light. DOCKING to send the robot to the docking station to recharge. START to start the cleaning. All three robots can be programmed to start working at a specific time of the day and on as many days of the week as needed. For bObsweep PetHair programming schedule is done on the charging station, while for bObi Classic and bObi Pet, it is done using the remote control device. For bObsweep PetHair you can press the SPEED button on the remote control device to change the cleaning speed of the robot. There are three speeds available: slow, medium, and fast. For bObi Classic and bObi Pet, the default speed setting is fast mode, which maximizes the area the robot covers while cleaning. However, you can slow the robot down for a deeper, more thorough cleaning by pressing the SPEED button on the remote control and press again to toggle between fast and slow modes. The fan on the lower left side of the remote control's screen indicates slow mode by displaying only four blades and fast mode by displaying full blades. Once the battery goes below 15%, bObsweep PetHair starts looking for its charging station and goes there automatically to charge itself. Once the battery falls below 15%, bObi Classic and bObi Pet also will automatically start searching for the charging station. These robots will emit a series of chirps, stop the vacuum motor to preserve energy, and light up the JUICE button on the robot's cover. They will then move to the charging station, dock, and begin to charge. You will know the robot is fully charged when the middle LED light on the cover stops blinking and turns solid. You can program all three robots to restart cleaning once recharging completes. These robots are not silent, but the noise made is less than the noise generated by a regular vacuum cleaner. bObsweep PetHair produces less than 70 db sound, while bObi Classic and bObi Pet produce less than 60 db while cleaning, compared to around 90 decibels for many upright vacuums. These robots are quiet enough that most people can still hear things like the phone or doorbell ringing. If you're sensitive to sound, though, you can always program these robots to work while you're not around. Note that according to the manufacturer's website, there is also a 30-day money back guarantee for bObi Classic and a 60-day money back guarantee for bObi Pet. For exact price information on these robots, please refer to the Amazon section below. So, which of the three robots is best for your home? All three robots compared above are great products as many very satisfied Amazon customers have expressed in their reviews. But in terms of sophistication and ease of use, we prefer the bObi Classic and bObi Pet robots. They have simpler covers with very few buttons on them, and their screen is on their remote control device, so you don't have to stoop to see what is going on on the robot. They are also equipped with a dual main brush system, as opposed to a single main brush for the bObsweep PetHair, and therefore they can dust and clean better. Finally, they have more powerful vacuum-motors, and they are compatible with containment bObi blOcks to prevent the robot going into off-limits areas. 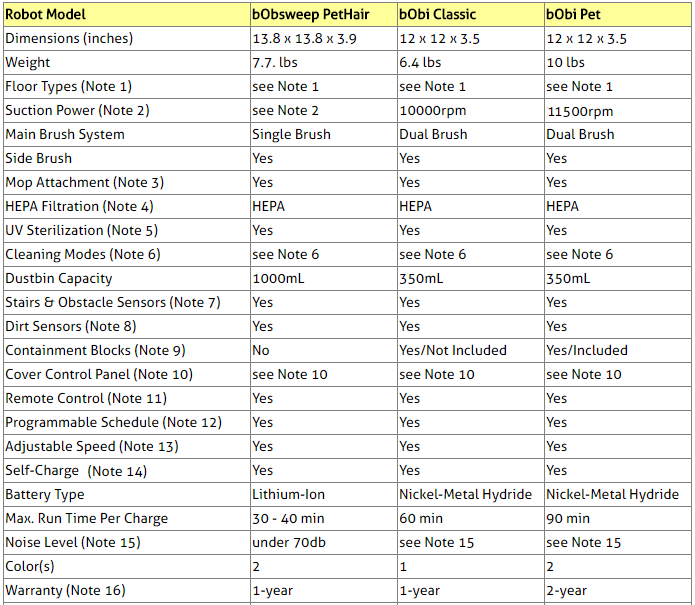 On the other hand, bObsweep PetHair has a much larger dustbin (1000 mL vs. 350 mL), and you don't have to empty it as often. So, unless you have a very large home, that will require emptying the dustbin often, we prefer the bObi Classic and bObi Pet robots. Note however, that bObi Pet has a more powerful vacuum-motor than bObi Classic (11,500 rpm vs. 10,000 rpm), it is equipped with more touch sensors than bObi Classic, and that no bObi blOck is included with the purchase of a bObi Classic, but there is one included when you buy bObi Pet. Please click below the robot of your choice for exact price information or to purchase. If additional colors of a model exists, they will be presented to you when you click the Amazon product link images below. PetHair Plus comes with an updated screen that is easier to use and that displays sentences instead of error codes to tell you something is wrong. PetHair Plus has an upgraded battery for longer cleaning times and longer battery life. PetHair Plus has stronger vacuum with stronger suction power, one of the strongest in the industry. PetHair Plus comes with the bObsweep blOck containment block included. It helps prevent the robot from entering certain areas of your home by acting as an invisible barrier. bObsweep Junior is the latest robot from the company which offers very effective sweeping/vacuuming with HEPA filtering without some of the other features found in the other bObsweep and bObi robots. More specifically, with bObsweep Junior, there is no mopping, you can not schedule the robot, there is no UV sterilization lamp and no containment block. Otherwise, it has all the other basic features of bObsweep robots, such as the ability to self charge when the battery goes low and the ability to avoid stairs and obstacles. It is equipped with a main brush, side brush and with a Lithium Ion battery. It comes with a remote-control device and it has a 1000 mL dustbin. ​Externally, it looks quite like bObsweep Standard, but its control panel is slightly different: it has an updated screen that is easier to use and that displays sentences instead of error codes to tell you something is wrong.